I did my best to get an authentic look of the little red Tractor. 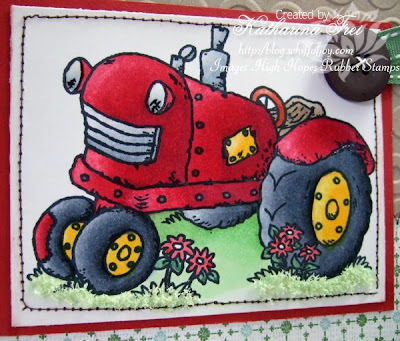 This charming image is from High Hopes Rubber Stamps and the minute I saw it, I knew I needed it :) This weeks challenge at the HHS blog is "buttons galore", which was perfect for a boy's birthday invitation card. 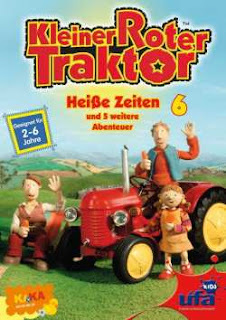 Ich habe mein Bestes gegeben um den kleinen roten Traktor authentisch aussehen zu lassen. Dieses charmante Motiv ist von High Hopes Rubber Stamps und ich wußte gleich, dass ich es unbedingt brauchte :) Das Thema dieser Woche bei der High Hopes Challenge ist "Knöpfe, Knöpfe, Knöpfe", perfekt für eine Jungen Geburtstagskarte. I embossed the kraft cardstock from SU with the cuttlebug embossing folder dots and spots and cut the border with some of those children scissors. Ich habe den Kraft cardstock von SU mit dem cuttlebug embossing folder dots and spots bearbeitet und die Ränder mit so einer zick zack Kinderschere abgeschnitten. I needed 4 invitation cards for Niklas' best friends, so I stamped the image 4 times and coloured them synchronously with my Copic Sketch Markers. Ich brauchte 4 Einladungskarten für Niklas' beste Freunde, deswegen habe ich das Motiv 4 x nebeneinander gestempelt und mit meinen Copic Sketch Markern synchron ausgemalt. I put some crystal effects on the lights and used my new Flower Soft for the grass. It gives a really cool effect and the colours are beautiful. It looks far better than fun flock. I bought myself a variety of colours at Crafts U Do. They are offering really low shipping costs inside Europe and the service was very good. Ich habe etwas Crystal effects von Stampin' Up auf die Lichter gegeben und eines meiner neuen Flower Soft für das Gras ausprobiert. Es gibt einen wirklich tollen Effekt und schaut viel besser aus als fun flock. Ich habe mir gleich ein paar Farben gegönnt. Gekauft habe ich es bei Crafts U Do. Das ist zwar eine britische Firma, die bieten aber sensationell günstige Versandkosten innerhalb Europas. Das Service und die Kommunikation waren auch sehr gut. The sentiment is from the german Whiff of Joy party text collection and means "Invitation". The below picture shows the colours of the Copic Markers I used. Der Text ist von dem deutschen Whiff of Joy Party und Geburtstags Set. Das untere Foto zeigt die Copic Farben, die ich verwendet habe. Thanks for your visit, enjoy your day! Danke für euren Besuch, genießt den Tag! 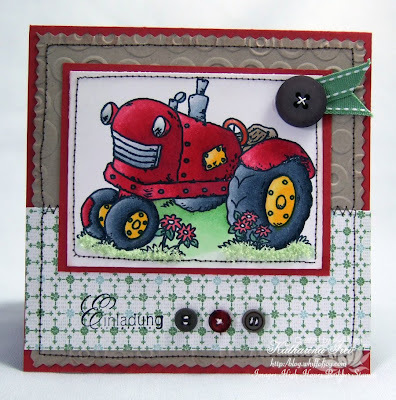 Paper: SU cardstock "riding hood red and kraft", SU dp "Afternoon Tea"
These are absolutely gorgeous Katahrina, love the tractor and so beautfully coloured! Die Karte ist ja auch wieder richtig klasse geworden und das Flower soft sieht auch toll dazu aus. Brilliant, I'm sure your son is happy, and his friends will be wild impressed. A very head on!! Gorgeous invitationcards!! He must love these! They're gorgeous Kathrina! It's sure to be a great party when the invitations look that good!! lol! 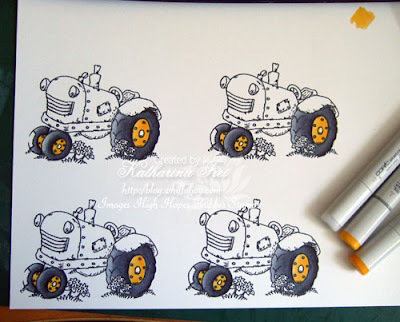 Fabulous tractor image, love these invites, so perfect for kids! They are amazing!! I'm sure your son was pleased! Das sind wirklich schöne und für den Anlass total passende Einladungskarten geworden! Superschön coloriert! die Einladungskarten sind so süß geworden. Wunderschön. wowww Katharina,waht a beautiful card. 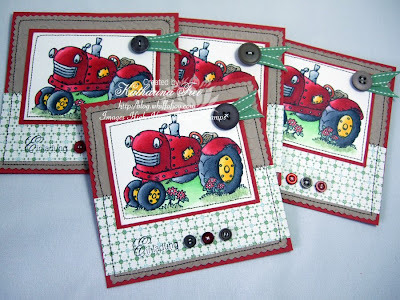 Oh wow those invites are fab, i love the little tractor stamp it,s so cute. Da hat sich dein Sohn aber bestimmt riesig gefreut. What a beautiful card Katharina and the colors super. Absolutely brilliant Katherina!They would be perfect to frame for a little boy's room! Isn't it funny that we buy things our kids would like? I just bought my third train stamp set becuase my son has LOOOVED Thomas the Tank Engine for almost 5 years now! LOL! Wow, these are adorable, Katharina!! I must be a wimp...I could even imagine making 4 of these, lol!! Your coloring is beautiful...& looks exactly the same on all 4 cards! Now only a pro could do that!! oh Katharina, these are absolutely darling. I just love them! I miss those days when my son needed such invitations. Now he's 14, he could care less. LOL Your day is coming, cherrish every second, it goes by way to quickly. These are awesome...amazing how well this stamp goes with the TV character! I bet your son was thrilled! What super cute invitations!!! They are adorable! So cuper Katharina!! They're wonderful! die Einladungskarten sind dir sehr gut gelungen. Die Einladungskarten sind richtig toll geworden. Da werden sich die kleinen bestimmt sehr freuen. Adorable tractor such brilliant colouring. Der is ja voll genial! Da freut sich dein Sohnemann sicher! Tolle Einladungskarten Katharina und super coloriert! Da wird Niklas happy sein, wuensche eine tolle Party!!! Hi Katharina Just love this and I bet your son does too. Love the colouring its beautiful.